Go ahead and chuckle, but don't let the name fool you. 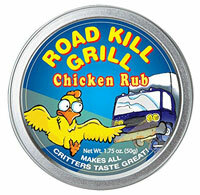 Road Kill Grill Chicken Rub is just one of the tantalizing spice rubs in the Road Kill Grill lineup, which collectively sports the promising tagline, "Makes All Critters Taste Great." Road Kill Grill Seasonings give your meat a whole new flavor.